I caught this post on mobile recruiting by FOT founder, Kris Dunn. In the post, KD references a press release from the fast-casual chain Chipotle announcing their new web-based job application . The chain launched their mobile app in October of 2014, and in the first week, mobile applications accounted for 20 percent of incoming job applications, a total of roughly 5,000 applications. Not too shabby, and it clearly showcases that there’s an appetite for a mobile apply option by their candidate base. What I like about Chipotle’s approach is that it highlight’s the collision of opinions around mobile best practices. For me, the baseline of a mobile strategy falls into two camps: fully responsive careers site experience and mobile applications. In a fully responsive career site experience, your site is either built responsively (or adaptively if you are constrained to a legacy CMS), and all of the content housed on your careers site renders in a clean and easily consumable format. As a best practice, you’ve also deployed a mobile application that aligns to and supports calls to action to apply on your mobile careers site. In Chipotle’s case, they’ve invested in the latter. In the press release, the author purposely calls the solution a web-based job application and not a mobile recruiting site. 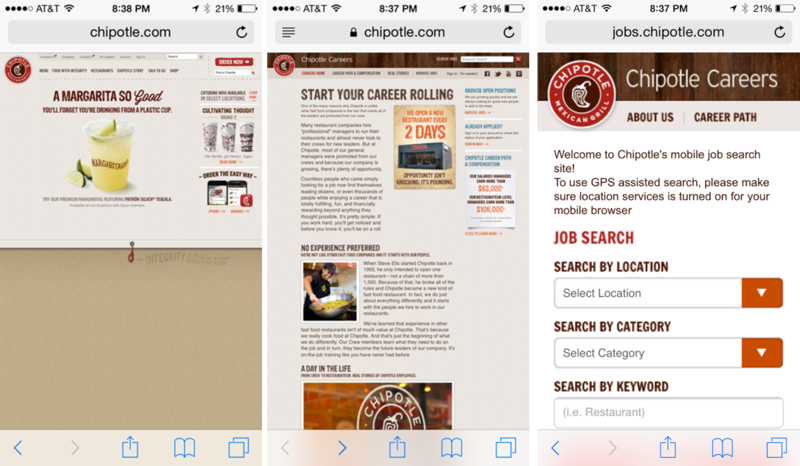 If you visit the Chipotle careers site from your phone/tablet, you’ll still need to pinch and pull until you are ready to search careers. It’s not until you select browse jobs and enter their search careers section, that you are taken to a mobile-friendly search experience. Is only having a mobile application okay? My take is yes, only optimizing your application is a perfectly acceptable practice! In looking at the traffic for one of the clients I support, we receive 5x the amount of traffic from our careers landing page to our search jobs action than we do our next most visited page (benefits). For me, this data signals that people are primarily interested in getting to what opportunities the company has to offer before they circle back and vet that client as a potential employer, and I’m sure Chipotle has similar analytics. Heavy traffic flow to jobs vs. careers site content also highlights that a properly formatted and compelling job description is critical, because it’s the first—and potentially only—piece of content the candidate is going to spend some real time with before deciding to apply. If I had to choose between a responsive site and mobile application, I’d put my money towards a mobile application. While having a fully responsive experience is ideal, not having one isn’t going to kill your candidate flow. But an application that is non-mobile will inevitably lead to drop off. While there are a handful of great options on the market (Chipotle uses Jibe), I’d have to say Mobolt is the easiest to deploy and most cost-effective solut that I’ve seen to date. At a 50,000 foot view, Mobolt is a gooey overlay that sits on top of your ATS, and their platform extracts your application and then renders it for mobile. Because Mobolt sits on top of your ATS, deploying their solution does not require you to go down the IT/API/or project planning rabbit hole; and if that isn’t sweet enough, here is some icing on the cake… Mobolt customers also receive Indeed mobile PPC dollars equal to their solution investment. It’s a mobile recruiting win-win. So if you don’t have a mobile application, and you do have budget allocated for Indeed n 2015, then I’d hop on the phone with your rep ASAP. Tune in next time and I’ll break the list down in detail! In the interim, what’s your take on mobile?